Puerto Rico’s near-total devastation from Hurricane Maria in 2017 has spawned several unusual technological attempts to bring communications on the island into the 21st century. Maria claimed almost 3,000 lives and left the island without power and communications for months in many areas. The hurricane completely destroyed the island’s power grid, leaving all 3.4 million residents without electricity. By June of 2018, some 11,000 residents were still without power. In some areas, communications reverted to an almost primitive state. Residents resorted to waving homemade flags and banging pots to alert neighbors and first responders to their plight. “With telephone service blown away by the Category 4 hurricane, the governor [Ricardo Antonio Rosselló] took to the only radio station still operating and asked listeners to tell the mayors of all 78 municipalities to drive to the capital and update authorities about their needs in person. Access to devastated areas was impossible, and police, firefighters and emergency responders were unable to talk to each other for days,” the AP article recounted. This year, however, several tech-savvy groups and individuals in Puerto Rico are making a concerted effort to ensure there won’t be a repeat of the communications disaster. They are testing systems that could potentially help storm survivors stay in touch with authorities during emergencies. One IBM-backed group of developers, for example, has combined high-tech and low-tech innovations, attaching transmitters to trees with Velcro. The tiny transmitter boxes emit a low-frequency Wi-Fi connection that users can link to via smartphones, AP explained. Although this device sounds pretty lame, the group’s Project OWL (Organization, Whereabouts and Logistics) won a $200,000 prize last year at the inaugural Call for Code competition in San Francisco. The winning two-part hardware/software solution of the Wi-Fi transmitter boxes creates an offline communication infrastructure that gives first responders a simple interface for managing all aspects of a disaster, an IBM announcement said. “The physical ‘clusterduck’ network is made of hubs resembling rubber ducks, which can float in flooded areas if needed. Only five are needed to cover a square mile, and they create a mesh network that can send speech-based communications using conversational systems (like Alexa and Facebook Messenger) to a central application,” IBM explained. The transmitters on trees might act the same way. Pedro Cruz is a self-taught tech developer in Puerto Rico who recently won a local hackathon with a project called DroneAid. “He envisions before a storm giving people 5-foot-long mats with standardized symbols indicating needs — such as food, water or medical care — that could be spread out on flat surfaces. Programmed drones could fly overhead, read the symbols and process them into data about needs and locations for emergency responders,” the AP story explained. Cruz said he got the idea from messages he saw after Maria, such as “SOS” and “WE NEED FOOD” scrawled in big letters on roads so they could be seen from the air. Not all of these ideas originated with one individual or a small group. Google obtained an experimental license from the Federal Communications Commission to provide emergency cellular service via Loon balloons. “Project Loon partners with telecommunications companies to share cellular spectrum so that people will be able to access the Internet everywhere directly from their phones and other LTE-enabled devices,” Google explained. 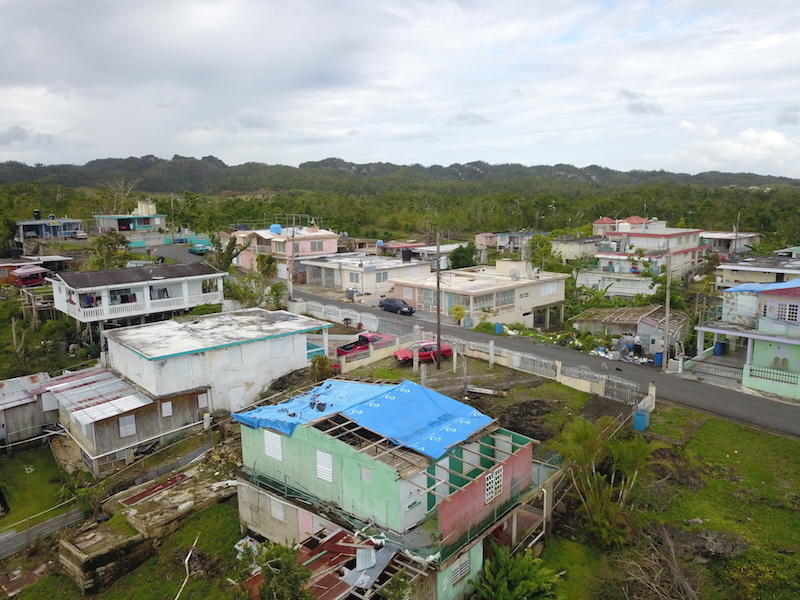 Whether or not any of these projects work as planned, Emergency Managers Association chief Lugo told AP that Puerto Rico must strengthen and update its communications system before the hurricane season starts on June 1. No one can accurately predict what the approaching 2019 hurricane season will have in store, especially this far in advance. An average Atlantic hurricane season consists of 12 named storms, six hurricanes and three major hurricanes. The past three seasons have included a larger than normal string of major hurricanes – Matthew, Harvey, Irma, Maria, Florence and Michael. Hurricane Florence was one of two major Atlantic hurricanes in 2018. The September storm prompted large-scale flooding and evacuations in the Carolinas and Virginia. At least 51 people died. It was the wettest tropical system ever to hit North Carolina. Areas received nearly three feet of rain. On October 10, Hurricane Michael became the strongest hurricane on record to hit the Florida Panhandle. With winds of 155 mph the Category 4 storm leveled much of Panama City and surrounding communities. So if the past is indeed prologue, as Shakespeare appropriately said in “The Tempest,” we should expect another active hurricane season this summer.